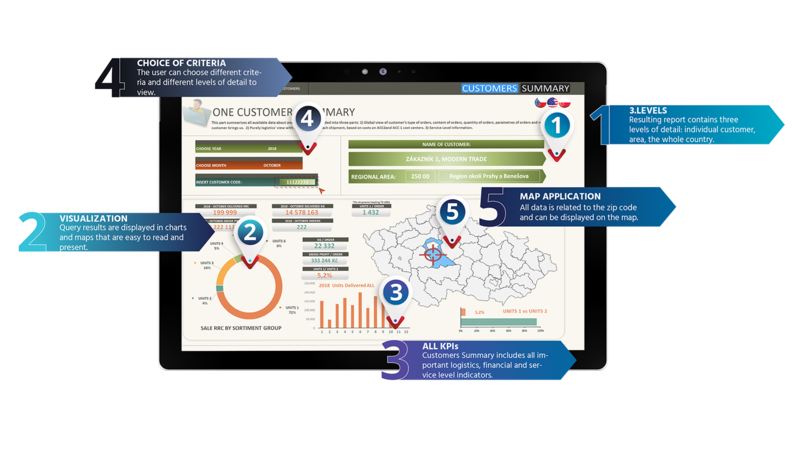 KPIs reporting solution for logistics, with emphasis on customer and service level. Customers Summary is a monthly service level KPI report for logistics. It conatins detailed information about each customer, logistics and service level results sorted by regions and complex overview of key performance indicators for the whole country. All indicators are displayed on the map of the Czech Republic or in charts. 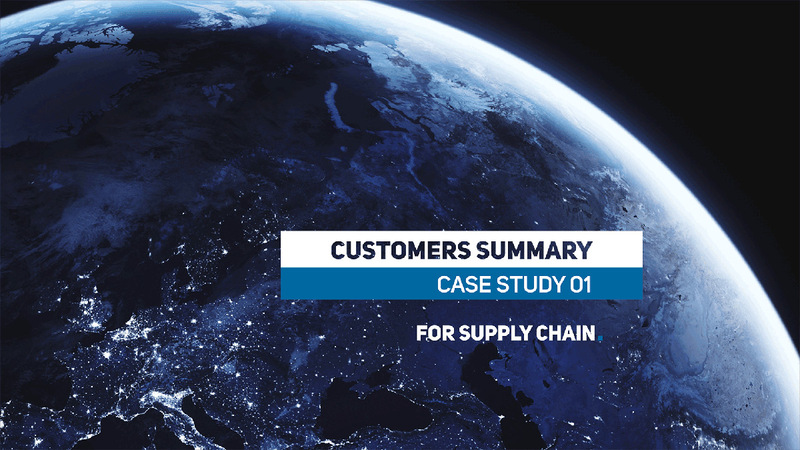 We have developed Customers Summary for a client with tens of thousands of B2B customers and hundreds of SKUs. We also service the report for our client and update it on a monthly basis. The client, specifically his logistics and finance department, needs to have an overview of how his operations look from the point of view of service level. Customer service tracks the logistics costs of each customer, the ratio of complete and incomplete deliveries and other factors. At the same time, our client wants to have a general overview. For instance how individual SKUs are delivered to individual regions or how individual delivery routes are used. Large database systems used by the client are not designed for comprehensive display of complex data and results. Customers Summary addresses all these requirements. In addition, the presented results are well-arranged, easy to read and very well visualized. When developing the Customers Summary, we first made clear what data from which data systems and modules we would need to process. Subsequently, we developed a service computing module. It processes and links data from hundreds of thousands of rows of records so that only optimized results of calculations enter the resulting report. The result of it all is a report which works fast despite the large amount of data. Visualisation of results based on the criteria set by the user is a matter of seconds. Individual customer – In the section dedicated to individual customers, the user can see information about the number, composition and value of orders for each of more than ten thousand customers. Furthermore there are logistics moves and costs sorted by logistics channels. This level of detail also includes service level information for each customer, namely the ratio of in-full and on-time deliveries. Region – In the regions section, the user can choose a region by zip code and display the same information for the selected region as in the section with individual customers, i.e. orders, logistics costs and service level. All Logistics – The general logistics section allows the user to display on the map of the Czech Republic a variety of logistic data and units combinations. For example, a specific route in terms of volume of transported goods, type of goods by volume and region, volumes shipped by a particular logistics partner and many others. In addition, this section of the report can also show sales volumes of individual SKUs in regions. Every month, new customers are gained, distribution routes are changing, number of transportation companies changes and so on. We service this report for the client. We use state-of-the-art technology to efficiently process large amounts of data from the entire month, specifically cloud server solutions with dozens of processors. We update all the necessary criteria and prepare and insert current data from the previous month. Thanks to the cross-checking mechanisms implemented in the report, we also effectively check the correctness of the results every month. KPI reporting solutions are an important part of our services. For our clients we have developed a number of complex, efficient and time saving solutions. We can name for example Operations Summary, Warehouse Summary or Daily Overview of KPIs in Logistics.